WITH THE Children in Need and Radio Times special, a UK Gold celebration weekend, BBC Video releases and Virgin Books's New Adventure series, Doctor Who was at last celebrated in some style on his 30th anniversary. 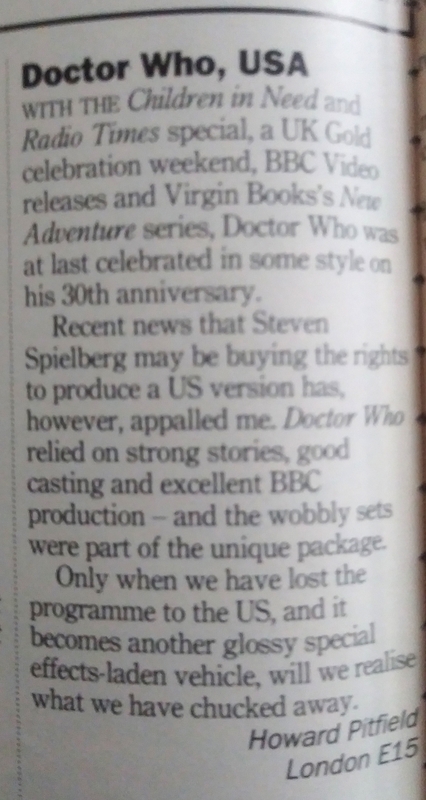 Recent news that Stephen Spielberg may be buying the rights to produce a US version has, however, appalled me. Doctor Who relied on strong stories, good casting and excellent BBC production and the wobbly sets were part of the unique package. Only when we have lost the programme to the US, and it becomes another glossy effects-laden vehicle, will we realise what we have chucked away. APA 6th ed. : (1993-12-04). Doctor Who, USA. Radio Times p. 124. MLA 7th ed. : "Doctor Who, USA." Radio Times [add city] 1993-12-04, 124. Print. Turabian: "Doctor Who, USA." Radio Times, 1993-12-04, section, 124 edition. This page was last modified on 6 April 2019, at 18:11.